Montee Ball ran for 202 yards and three touchdowns and the Badgers scored seven touchdowns on their first nine possessions, blowing out Nebraska 70-31 to win their third straight Big Ten title on Saturday night. Wisconsin will be the first five-loss team to play in the Rose Bowl and is the first school to represent the league in three consecutive Rose Bowls since Michigan in the late 1970s. Nebraska coach Bo Pelini and his players were left shaking their heads as a third league championship game opportunity faded away. This was the second time this year that the Huskers have totally been dismantled by a Big Ten team first Ohio State and now Wisconsin. Husker nation has yet another season under Bo Pelini whose expertise is defense in which the Blackshirts have been very average. The Huskers inability to make defensive adjustments during games has been an issue for a few years now. The defense scheme that isn't aggressive or attacking in any way has Husker fans scratching their heads. When you see Bo making one of those faces on the sideline after a bad play, it's the same face I see from Husker fans every time he sends out a Husker team that looks unprepared to play the game. It's time we start asking the question, is Bo Pelini the right person for this job? Before kickoff the Husker faithful got excited when they saw how good Rex Burkhead looked while he was warming up. The fact that the Huskers have won their last five straight games, mostly without him, doesn't mean Nebraska doesn't need Rex Burkhead. Rex didn't play in what was mostly a defensive battle in the first half with Iowa leading at halftime 7-3. In the second half, on a cold and blustery afternoon with a spot in the Big Ten title game on the line, Burkhead proved why he's so valuable to the Huskers. Burkhead scored the go-ahead touchdown in his return from a knee injury and the Huskers beat Iowa 13-7 on Friday to claim the Legends Division's berth in the championship game. The Huskers will face off against Wisconsin next Saturday in Indianapolis after winning six straight since a loss at Ohio State. It'll be a rematch of Nebraska's thrilling 30-27 home win over the Badgers in late September. Go Big Red! The Huskers were leaving nothing to chance as they were on upset alert for this game against the Gophers. The Huskers were clicking on all cylinders from the get-go, building a 24-0 lead and limiting the Gophers' offense to just 60 yards in the first half. It only got worse from there, as the Huskers led 38-0 before putting in the second stringers dominating Minnesota 38-14 in their final home game on Saturday. The Huskers did it through the air with Taylor Martinez throwing for 308 yards going 21-for-29. Kenny Bell had one of his best games, with nine catches for 136 yards and two scores. The Blackshirts were just as impressive, holding the Gophers to 8-for-23 passing for only 59 yards. Stanley Jean-Baptiste returned an interception 48 yards for a touchdown. Until the middle of the fourth quarter Minnesota was 0-for-11 on third downs and didn't crack 100 yards of total offense. The Gophers only points came late in the game when the Huskers' backups came in. Next week the Huskers travel to Iowa City to take on the Hawkeyes. Go Big Red! This isn't your father's old Nebraska team. I can remember whole decades when Nebraska only had 4 come from behind victories. This year's Nebraska team sure has a flair for the dramatic. In four of their last six games, they have overcome a double-digit second-half deficit to win a football game. This time the Huskers came from 14 points down to beat Penn State 32-23 on Saturday. The turning point, according to Penn State, was a fumble in the middle of the fourth quarter with Nebraska leading 27-23. Penn State's tight end was ruled to have fumbled into the end zone before the ball crossed the goal line. Nebraska recovered and the call was confirmed on video review. Penn State followers will point to this play as the reason they lost the game, but as you can see by the final score, the Huskers would have still won the game by 2. Ameer Abdullah ran for 116 yards on a career-high 31 carries, and Martinez finished with 104 yards as the Huskers pounded away on the ground on a very windy afternoon. The Huskers also got TD runs of 1 and 2 yards from freshman RB Imani Cross early in the third quarter to tie it and wipe out a 20-6 deficit. Next week the Huskers have Minnesota coming to Lincoln. Go Big Red! Nebraska had to make some plays late to earn a victory over Michigan State, beating the Spartans 28-24 when Martinez threw a 5-yard touchdown pass to Jamal Turner with 6 seconds left in the game Saturday night. After the game, Jamal said, "I can't believe that I won the game, I've been dreaming about this my whole life." 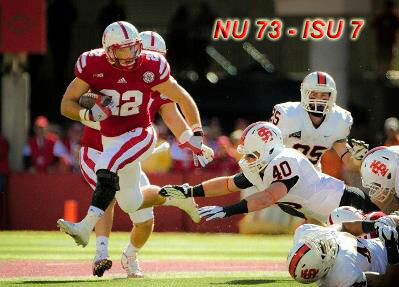 Turner's touchdown capped a thrilling comeback in which the Cornhuskers scored two touchdowns in the final 7:02. Nebraska (7-2, 4-1) remains tied with Michigan atop the Big Ten Legends Division. The Huskers own the tie breaker because they beat the Wolverines head to head. Martinez rushed for 205 yards and two touchdowns, becoming Nebraska's career leader in total offense, passing 2001 Heisman Trophy winner Eric Crouch with a dynamic first half. Martinez, a junior, now has 8,166 yards of total offense. Crouch had 7,915. It was the third time this season in conference play that Nebraska rallied from a double-digit deficit in the second half. The Huskers play Penn State in Lincoln next weekend. Go Big Red! This game was billed as the second meeting ever between quarterbacks who each have 5,000 yards passing and 2,000 yards rushing in their careers. Nebraska took control of the Big Ten Legends Division, and all Denard Robinson could do was watch. Ameer Abdullah rushed for 101 yards and a touchdown, and Nebraska's defense dominated after Robinson left with an injury late in the first half in a 23-9 victory over Michigan on Saturday night. Abdullah, filling in for the injured Rex Burkhead, went over 100 yards for the fourth time this season. The Huskers moved into a first-place tie with Michigan in the Legends but now own the tiebreaker with this victory. Taylor Martinez was 14 of 24 for 166 yards with an interception for the Huskers. The Huskers have won 11 straight night games at Memorial Stadium and are 37-5 under the lights in Lincoln since 1986. Nebraska commemorated the 50th anniversary of its NCAA-record sellout streak. Saturday's game was the 323rd in a row. The home crowd will not help next week as the Huskers travel to East Lansing to take on Michigan State. Go Big Red! Once again this year the Huskers start the game off by putting themselves behind while turning the ball over 3 times in the first half. To make matters worse, we lost Rex Burkhead early with an unspecified injury. After trailing for the majority of the game, the Huskers rallied from 12 down in the fourth to beat Northwestern 29-28 on Saturday. Taylor Martinez threw for 342 yards and three touchdowns, but none were more important than when Martinez hit Ben Cotton with a 7-yard pass with just more than 2 minutes left. The Husker offense also had Quincy Enunwa adding 110 yards receiving, while Kenny Bell caught six passes for 77 yards and a touchdown. Ameer Abdullah ran for 101 yards on the day in relief of Rex Burkhead. This win kept Nebraska in the thick of the Legends division race after being blown out at Ohio State two weeks earlier. Things do not get any easier for the Huskers as they return home to play Michigan next weekend for what could help decide the Legends division race. Go Big Red! We knew there might be some growing pains moving to the Big 10 conference, but we weren't expecting anything like this. Things looked good early in the first half when the Huskers scored 17 straight points to take a 17-7 lead. The Husker Nation was feeling pretty good, but "not so fast my friend" the Ohio State offense came alive and flew past the Huskers on the way to a convincing 63 - 38 victory. The 63 points put on the Huskers by Ohio State was the fourth most in school history. The Huskers' offense did look good in the first half when they tried a little trickery in the red zone, splitting Taylor Martinez out wide and putting Rex Burkhead under center. Twice Burkhead pitched to Ameer Abdullah for touchdowns in the first half. One bright note on defense was Eric Martin tallying two sacks. His strong play on defense continues to be a bright spot for the defense. The Huskers have an extra week to prepare for Northwestern who beat the Huskers last year. After this most recent beat down they are going to need it. GO BIG RED! The Huskers looked as bad as their new uniforms early in the first half spotting the Badgers a 20 to 10 lead at halftime. The Huskers had too many 3 and outs and turnovers in the first half and everything seemed to bouncing the Badgers' way. Even with the poor play at halftime, you had the feeling that the Huskers were going to put it together in the second half and win the game. The Husker defense stopped the Badgers on the first possession in the second half only to have QB Taylor Martinez sacked and fumble the ball back to the Badgers on the Huskers 13 yard line. The Badgers scored 4 plays later on a 2 yard rush by RB Montee Ball to make the game 27 to 10. Even then you still had the feeling that the Badgers were benefiting from lucky breaks and if the Huskers would just get it together they could still win this game. That's exactly what happened. The Huskers' offense started to roll led by QB Taylor Martinez and an offense started to gain yards both on the ground and through the air. The Huskers offense scored 20 unanswered points in the second half on the way to an impressive come from behind victory winning 30 - 27. The Blackshirts also played inspired ball in the second half shutting down the Badgers' offense. The Huskers will have to get off to a quicker start next weekend as they go on the road against Ohio State. GO BIG RED! Rex Burkhead returned to the starting lineup and ran for 119 yards and two touchdowns Saturday as the No. 25 Huskers made short work of Idaho State. The game got out of hand early. The Huskers led 35-0 after the first quarter and 45-0 at the half before cruising to a 73-7 victory. With Ciante Evans' 29-yard interception return and Ameer Abdullah's 81-yard punt return, the Huskers scored on offense, defense and special teams for the first time since 2009. Once the Huskers built up a hefty lead, the starting lineup came out of the game, and more backups began to see playing time. Quarterback Ron Kellogg III saw significant playing time throughout the game, while the rest of the reserve unit on the offense soon followed. The Huskers played 90 players. They outgained Idaho State 569-210, notched eight sacks and 15 tackles for a loss, had six scoring plays of 25 yards or longer and kicked eight touchbacks. This game seemed more like a spirited practice for the Huskers, but next week's Big 10 play begins and the Wisconsin Badgers come to Lincoln. The Huskers are eager to avenge their embarrassing 48 to 17 loss last year and next Saturday evening they will get that chance. The Husker nation was holding their collative breath when Bo Pelini was taken by ambulance to a hospital while his Cornhuskers were in the middle of a 42-13 victory over Arkansas State on Saturday. Defensive coordinator John Papuchis remembers thinking that Pelini was just a little bit less vocal than he normally was. Pelini said in a statement after the game that he underwent precautionary tests that "checked out just fine." Taylor Martinez was 13 of 14 for 180 yards with touchdown passes of 42 and 25 yards to Bell. The Blackshirts mixed three-man and four-man defensive fronts against Arkansas State holding them to just 13 points well below their season average. The Defense seemed more in control. They played together with little to no confusion on the field. The improved speed on defense was definitely noticeable. Players were flying to the ball and playing fast as a unit. The Huskers finished the day with 527 yards, 347 on the ground. Clearly, with a much better effort this weekend, the Huskers are making improvements as they get ready for Big 10 play. Next weekend they have 1 more tune up game as Idaho State visits. Go Big Red! 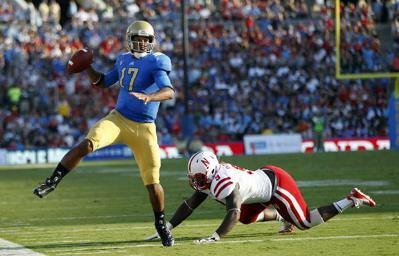 The Huskers suffered one of their worst performances of the Pelini era in last week's 36-30 loss at UCLA, surrendering 653 total yards, or seven more than Rice yielded the week before against the Bruins. Pelini used words like "embarrassed" and "sickened" to describe the defensive debacle. I know that's how I felt watching the game, but I couldn't help but wonder how with a defensive minded coach like Pelini the Blackshirts seem to perform so poorly over the past 2 years? Why would you not attack the FRESHMAN UCLA quarterback by sending more than just 4 lineman to rush the quarterback? Why did we not make any adjustments at halftime to attack the UCLA offense. Why did it look like we were playing a prevent defense the entire game? Pelini you don't have a Ndamukong Suh any more so I do not know why you think that 4 defensive linemen are all you need to get pressure on the quarterback. You saw how that worked last year and it looks like much of the same is in store for the Husker Nation this year. This loss may be the beginning of the end for Coach Pelini who is unable to build a defense around the talent he has or make adjustments in game time situations. Pelini insisted it wasn't the scheme as much as the execution. For his sake I hope he is right. Today's game started like most Husker games, by establishing the run as Rex Burkhead scored on the first drive of the game with an impressive 57 yard touchdown run. Later in the quarter Burkhead suffered a left MCL sprain and did not play the rest of the game. Now all the hype of Taylor Martinez and his improved passing mechanics this off-season was about to be tested and he showed off his new skills in this 49-20 victory over defending Conference USA champion Southern Miss. Taylor Martinez threw better than he ever has and became the first Husker quarterback in history to start three consecutive season openers, throwing for a career-high 354 yards while tying his career best with five touchdown passes to five different receivers. Martinez learned his new skills at the Manning Quarterback School this summer and it appears to have been worth every penny. The Huskers notched its nation-leading 27th consecutive season-opening victory, while opening its 50th straight season of home sellouts and retaining its NCAA-record 319th consecutive sellouts at Memorial Stadium. Husker Nation is now holding our collective breaths while we wait to hear if Rex Burkhead's injury isn't a serious one while we get ready to travel to California next weekend to take on the UCLA Bruins.